It's safe to say, for Sagan's sake, that by the nineties the BATTLESTAR GALACTICA franchise had pretty much run out of Energon. 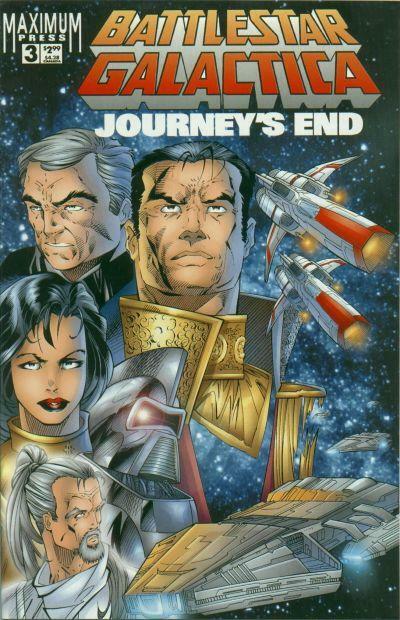 Remarkably, the novels had continued well into the previous decade (take note Buck Rogers!) but had finally expired in 1987. All of the show's other merchandising had been relegated to the discount racks years earlier and even the long-standing BATTLE FOR GALACTICA attraction on the Universal Studio Tour had shuttered in 1992. A small fandom, notably the UK's own THE THIRTEENTH TRIBE, was keeping the Colonial dream alive but - really - the chances of any sort of revival was next-to-none. Ironically, the BBC had done their bit to keep the show alive (and - certainly - revived my long-dormant interest) by rerunning the show in 1987-88, Wednesdays at 6pm on BBC TWO. Although it had done the regional rounds of the ITV network from 1980 (followed by GALACTICA 1980 in 1984), the BBC run was the first time the show had been networked*. Titan Books spotted an opportunity and re-released the first three novelisations in redesigned jacket designs. The BBC reran both series again a decade later and - in the intervening years - the show became a fixture of satellite TV with runs on (I think) the Sci-Fi Channel and Sky One. But - suddenly - mid-decade, BATTLESTAR started to show signs of life. 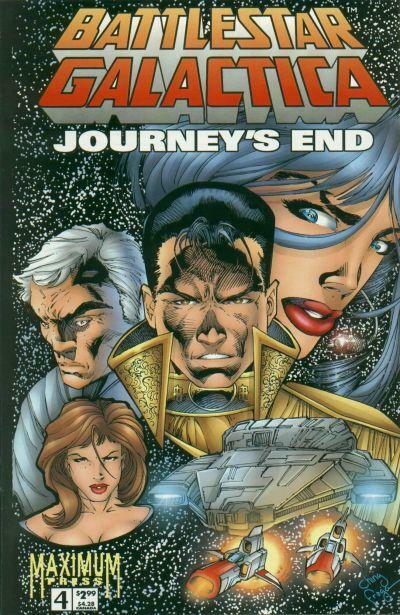 Spearheading this mini-merchandising boom was the new Battlestar comic (the first since Marvel's shuttered in the wake of the show's cancellation) from Maximum Press. 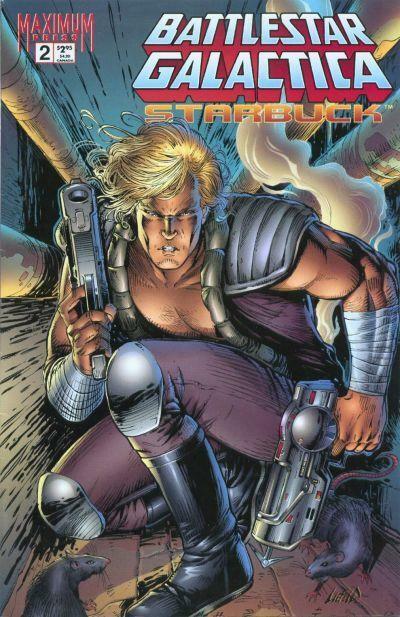 However, this being the so-called 'Dark Decade", as well as being under the auspices of comicdom's controversial Rob Liefeld, the new Battlestar - as you'll see from the cover gallery below - bore little resemblance to the show. Set twenty yahrns after the last sighting of the Colonial Fleet on TV (and ignoring G'80), everything - and everyone - looked very different. 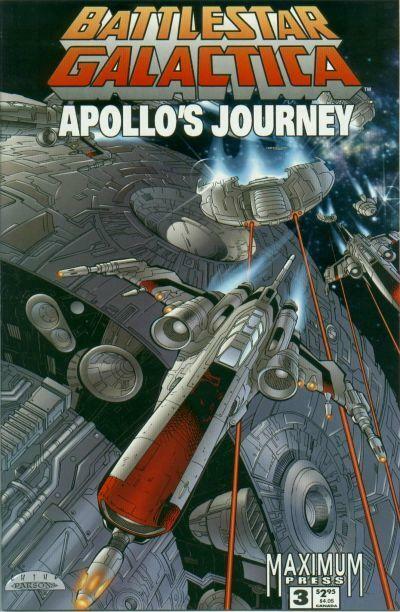 Take a peek at the first cover below, clockwise that's Baltar, Athena, Apollo, Starbuck and (of course) a Centurion. Really. 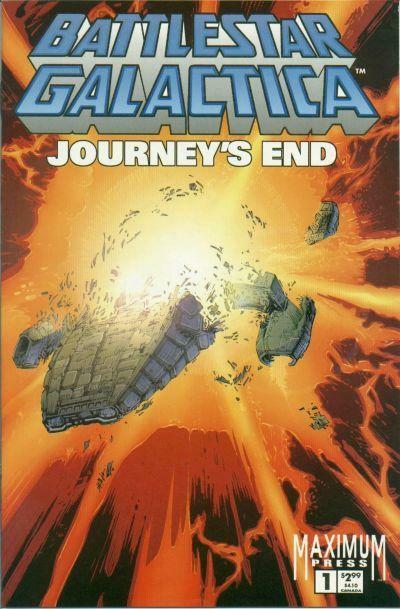 Long-term fans were underwhelmed to say the least but it was at least fun to see new comic books being published. 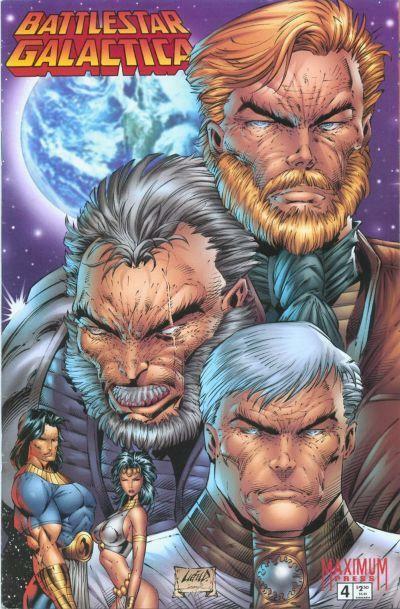 As was the industry way at the time, Maximum favoured a run of interconnected limited series to a regular book. 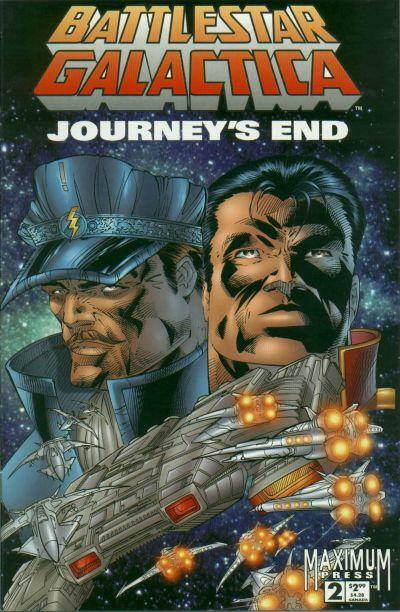 That opened-up the possibility of more trade paperback collections (although only the first series was reprinted in book form, behind the eye-catching cover first used for issue 2) and - of course - more sure-to-be-collectable first issues. 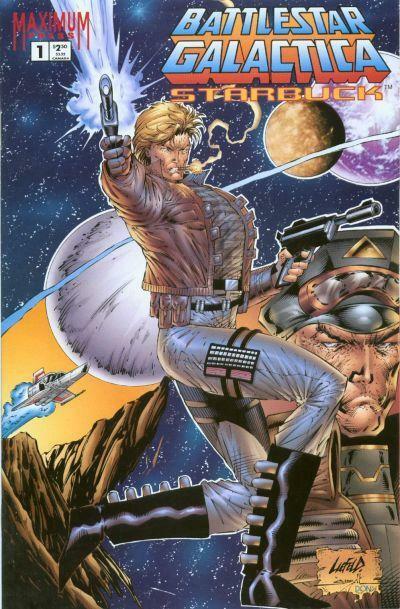 The run eventually petered out in early 1997, a combination of indifferent sales and the imminent implosion of Maximum Press itself (Liefeld was running the line as a side-line to his existing Image Comics commitments, a situation that so pissed-off the co-founders that they united against him and turfed him out of the alliance). There were also plans to revive another Universal property - THE SIX MILLION DOLLAR MAN - but the whole shebang spluttered to a halt before that could materialise. 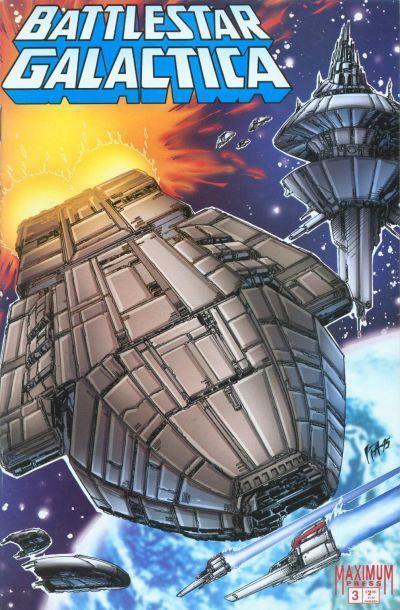 Accompanying the comic book was a new series of Battlestar toys, loosely based on the designs from the comic books, from Trendmaster Toys. Once again, the updating ensured that traditional fans were indifferent and new recruits were too few in number to make the line a raging success. Another new piece was a new set of trading cards using images from the show. * The BBC didn't - however - run the whole series. 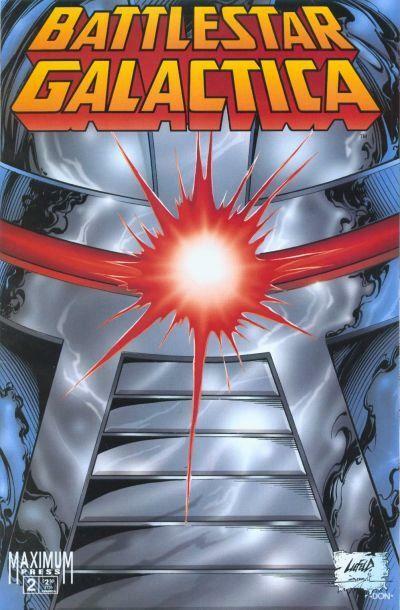 The rights to the movie version of Saga of a Star World as well as MISSION GALACTICA: THE CYLON ATTACK (and the feature-length opener of BUCK ROGERS IN THE 25th CENTURY) were still held by ITV as part of a movie package (all three later transferred to the BBC as well) placing the three-part pilot and The Living Legend off-limits. I think Fire in Space (the other constituent part of MISSION) was scheduled to run (getting a listing in the RADIO TIMES and - possibly - the national press TV listings) but - if memory serves - it was pulled at the last moment because of a real life fire disaster. It was never rescheduled and the BBC ploughed ahead (with the usual preemptions for sports, holiday periods etc.) with the second half of Battlestar and then onto GALACTICA 1980 (which - despite CONQUEST OF THE EARTH - aired intact). Looking at this gallery, I've realised that I'm missing a few items. 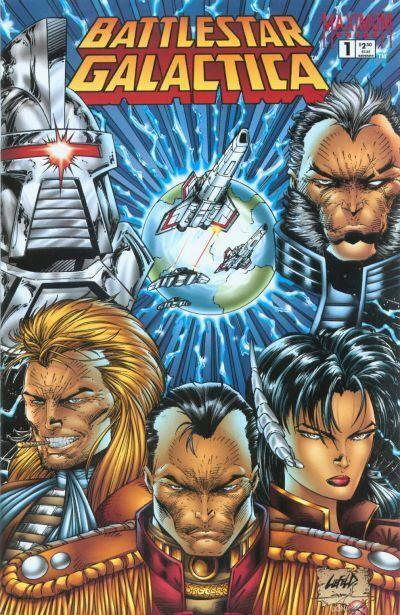 Maximum also published an anthology called ASYLUM which, amongst other unrelated properties, ran a multi-part "young Adama" strip (in issues 1-3) set in the period before the TV series (shades of BLOOD AND CHROME) which was subsequently collected in a one-shot (BATTLESTAR GALACTICA: THE COMPENDIUM). 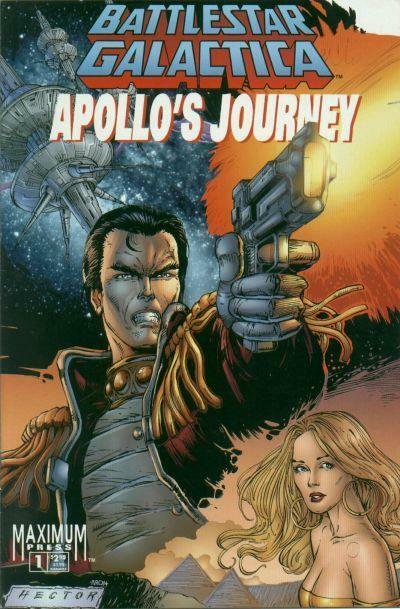 An Athena solo story followed in issues 4,5 & 7 (collected as BATTLESTAR GALACTICA: SPECIAL EDITION). 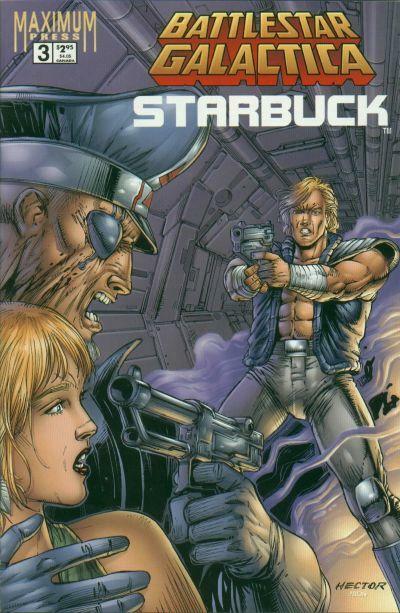 Issue eight featured the short First Date and 10 started The Rebirth of Cy although readers had to buy the SPECIAL EDITION to find out how the story wrapped. Asylum shuttered after 11 issues but Battlestar didn't appear in the final outing. Most issues didn't feature Battlestar on the cover so casual readers and fans would have been none-the-wiser. 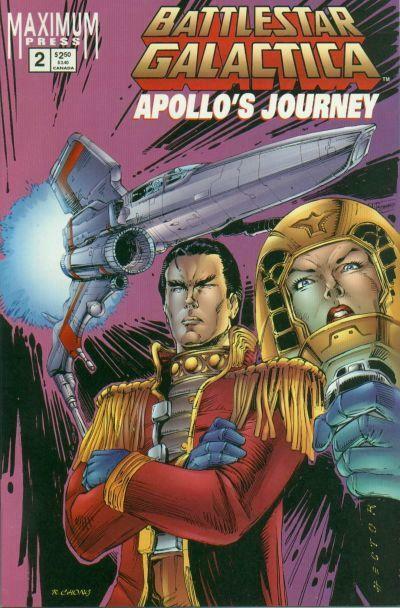 Someone really needs to reprint the entire Battlestar comic book back-catalogue (Marvel, Maximum Press, Realm Press, Dynamite Press and - of course - the British LOOK-IN strips).